If you’re working with Spark Streaming you might run into an interesting problem if you want to output an event based on a number of messages within a specific time period. For example: I want to send a security alert if I see 10 DDOS attempts to an IP address in a 5 minute window. The problem is your event will fire many times as the stateless RDD is re-run every batch period. External would be terrible and neither Spark counters or globals are much use here. Stop the RDD re-running and instead use streaming state. We can do this by using the reduceByKeyAndWindow overload that allows us to specify the inverse function for removing data as it goes out of window. Introduce a small amount of in-RDD state that can be used to identify when the event is cleared and when it should fire again. Here is the WindowEventTrigger class for your enjoyment. I’ve been learning Scala and decided to put together a C# to Scala cheat sheet. All is going pretty well but then I got stuck on the equivalent of Average. Enumerable.Average in .NET calculates a mean average from your sequence by summing up all the values and counting them in a single pass then returning the sum divided by the count in a floating point format (or decimal). What we do here is calculate an average as we go, adding the new weighted average each time. It achieves this by setting up a tuple to contain our initial state with (0.0, 1). This specifies our starting average of 0.0 and our starting position of 1. The next part specifies the function that takes that state as acc (for accumulator) and the next value in the sequence as i and calculates our rolling average for each value and increases the position as it goes along. Finally at the end of our call we specify ._1 which tells the compiler we want the first value from the tuple – the average – as we no longer care about the position. Be aware you might need multiple overloads for each numeric sequence type you want to be able to average given the lack of a common numeric trait that allows for the subtraction and division. There is some slight variance in results between this approach and the total / count due to rounding precision. If you wanted to preserve that you could always add and then divide at the end still in a single pass much like .NET does but with Scala’s foldLeft rather than a foreach. 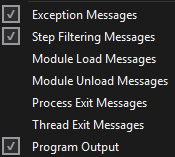 There are so many useful debugging features built into Visual Studio that aren’t well-known. Here are a few my favorites including some recent finds in VS 2013. If you click the left gutter to set breakpoints you could be easily mislead into thinking breakpoints happen at line level. You can actually insert a breakpoint inside parts of the line such as inside a lambda in your LINQ expression. Just right-click the part of the code and choose Breakpoint > Insert breakpoint from the context menu. The output window is useful for debugging where breakpoints would be too invasive or interrupt flow but it’s pretty noisy. Just right-click in the output window (make sure output is set to debug) and turn off the Module Load, Module Unload, Process Exit and Thread Exit to leave you with stuff you actually care about. Now Debug.WriteLine to your heart’s content. You can also press CtrlS in the output window to save the contents. It’s useful to have both server and client projects in a single solution so you only need one copy of Visual Studio running and don’t get lost alt-tabbing back and forth especially if they share common code such as a data model project. One disadvantage is that the start-up project is the only one to get a debugger attached. If you encounter an exception it will show in your client not your server project. That’s easily solved now. Right-click on the solution, choose properties and choose Multiple startup projects then select the Start action for the projects you need to attach to. If you’re responsible for a SDK or API create a simple application that uses your stuff in a small self-contained way. Then use File > Export template… to save it. Now you can create a new project from your template whenever you need it with a few clicks. Even better make it available to users and testers so they can send you minimal repros. By default the debugger will use ToString() for watch and auto windows which normally outputs class name. Even if you overrode ToString it’s probably not what somebody debugging wants to see at a glance. The “nq” prevents double-quotes from being emitted. You can also use methods here too but don’t do anything with subtle side-effects otherwise your observation of the subject will change its behavior and could cause weird issues. You set-up some interesting breakpoints and now you need to switch one-off for as it’s getting hit too much but you’ll need it again in a minute. If you remove the breakpoint you’ll have to come back and find it again. Enter the much-overlooked Breakpoints window CtrlAltB. This will show all breakpoints you have set but crucially lets you disable them without unsetting them by simply removing the check-mark. Check it again to re-enable it. There isn’t a global variable for the current method of the caller and getting the current stack can be a very slow operation. One quick and simple trick is to add an extra optional string parameter to the method with the CallerMemberName attribute. e.g. Sometimes you want to see what a function returned but you can’t easily because you didn’t store the value because it was the input to another function. The arrow icon indicates it’s a return value and it lets you know the name of the function alongside it. I also can’t stress enough how useful having logs are for troubleshooting once the software leaves your machine but that’s a much bigger discussion than this one. PS: Michael Parshin has some great tips on debugging too. Several years ago I worked on a payroll package developing a core engine that required an API to let third parties write calculations, validations and security gates that would execute as part of it’s regular operation. We were a small team and I had many conversations with another developer tasked with building a payroll using the API I would provide. Some methods here, classes there, the odd helper function and I had an API and then we had a mini payroll running. Then he showed me the code he had written and that smug grin dropped off my face. It was awful. Perhaps this other developer wasn’t as great as I’d thought? Looking at the code though made me realize he had done the best anyone could with a terrible API. I’d exposed parts of this core payroll engine with hooks when it needed a decision. Its job was to run the payroll – a very complex task that involved storage, translation, time periods, users and companies. That complexity and context had leaked out. Unfortunately it’s not a unique story – many API’s are terrible to use. They’re concerned with their own terminology, limitations and quirks because they are exposed sections of an underlying system developed by those responsible for the underlying system. If you want others to have a good experience with your product you have to put yourself in their shoes. Whether it’s a UI or an API makes no difference. That’s the real difference between writing the classes that form your regular implementation and those that make up your public API. We had time to fix our payroll API. Instead of refining and polishing here and there we took the 20 or so snippets developed for the mini payroll and pruned, cleaned and polished until they looked beautiful. They scanned well and made sense to payroll developers unfamiliar with our package. When a third developer familiar with payrolls but unfamiliar with out package developed the necessary code for a fully-functional jurisdiction in record time with minimal assistance we knew we had hit our goal. Sure implementing that new API was hard work. Instead of simple methods sticking out of the engine we had a facade over our engine but it was justified. They were two different systems for two different types of user with distinct ideas about what the system was and how it was going to be used. Many years later I found myself on a small team of 3 people tasked with putting a brand new API on top of Entity Framework for configuring models with code the .NET world would come to know as Code First. I was determined to use my experience and avoid another complex API surface littered with terminology and leaky abstractions. Parts of EF already suffered from that problem. So for the first few weeks of that project we didn’t write any of the code that would in fact become Code First. Instead we decided who our user was – in this case a C# developer who likes writing code, knows LINQ and some database concepts but doesn’t know Entity Framework as people who did were already using Model First or Database First. Then we wrote tiny sample apps and tried to find simpler and simpler ways to describe them in code. We’d often start on a whiteboard with a scenario and write the complete mapping. We’d then try and find conventions that would remove the need for most of it and then try to write succinct code to configure the rest. As the newest guy to the team I’d fight to keep EF terms away from the main API surface in order to reduce that barrier to entry and help drive adoption. Finally we’d hit the computer and develop stub classes and methods to make samples compile and let us try the IntelliSense. This isn’t always necessary but if you want to develop a fluent API or provide lots of type-safety such as Code First’s relationship mapping it’s highly recommended. We’d then revisit the samples later and see if they could be read as easily as they were written and figure out what problems people were likely to run into and whether we could solve them without too much noise. Sometimes this meant having more than one way to do things such as chaining the fluent methods or allowing a bunch of properties to be set (solved with an extension method class providing the fluent API) and how users could manage larger models (solved by sub-classing EntityConfiguration – now EntityTypeConfiguration sigh – and allowing redundant specification for things like relationships that span more than one class). We finally ended up with succinct code like this with IntelliSense guiding you along the way and preventing you from even being able to specify invalid combinations. The HasMany prompts the properties on Customer and it won’t show you WithRequired unless it is valid. In the case of Required to Required it will ensure that the WithRequired specified which end is principle and dependent. In short it guides you through the process and results in highly readable code. This process took a little longer but given the amount of use the API will get that time will be saved by users countless times over. Code First went down incredibly well with both the target audience and existing EF users and inspired the simpler DbContext interface that became the recommended way of accessing EF. I think it’s one of the nicer APIs to come out of Microsoft and .NET. PS. Martin Fowler has some great guidance in his book Domain Specific Languages.